Review Summary: WATER is Deepa Mehta's finest work to date and will win unprecedented critical acclaim in the Indian media. Water may have lost the Oscar to Germany's The Lives of Others in Best Foreign Film category. WATER is Deepa Mehta's finest work to date and will win unprecedented critical acclaim in the Indian media. What do you say about a film that hits you hard where it hurts the most so hard that it takes your breath away. Water is a powerful film. 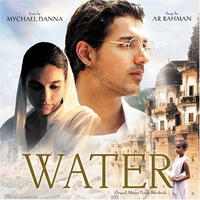 The fracas over the shooting of Deepa Mehta’s Water in India became the selling point of the film, rather than the story or its intended humanism. Even though Deepa Mehta's WATER has been in news for over an year and has even made it to the Top5 of the OSCARS shortlist for the best foreign film, one is a trifle hesitant about what to expect from the film. After all, the film doesn't stand out like one of your commercial films that would make audience create a beeline in front of the theaters. Moreover a subject that may have caught on the in the West could mainly have been due to the fact it explores the dark side of India, a country that is still about snake charmers and elephants for many out there.